A few months ago, talk of chocolate brownies being made with Hellman's mayonnaise was being bandied about on Twitter. My first reaction was a wrinkle of the nose. Mayonnaise always has that weird acidic smell when it's warm (my husband stirs it into his vegetables) and I thought that this taste or smell would end up permeating the brownie. So, unable to contain my curiosity, I decided to try the recipe out for myself. 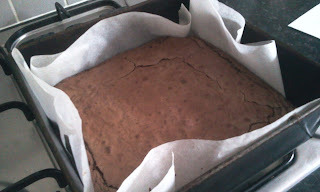 Firstly, it was really simple - the usual melted chocolate (I used Bourneville), sugar, eggs and flour - but no butter. The mayonnaise substituted that. The oils in the mayonnaise make it stable when heated (so no splitting) and the reduced fat means that these brownies contain around 55% less saturated fat than regular brownies. I was also relieved to find out that although you do get that characteristic smell as you stir the glossy mayonnaise into the chocolate, there is no trace of it in the finished brownie. Phew for that. But how did it turn out? The top was pale brown, with a thin crisp layer and crackled on the surface. Just what you want from a good chocolate brownie. Underneath, it was dark and fudgy. They actually do taste lighter than ordinary brownies and so in my mind they are better for an 'everyday' treat (although I don't suggest you eat them every day!) - for lunchboxes and picnics etc and can easily be whipped up for friends if they stop by for coffee. 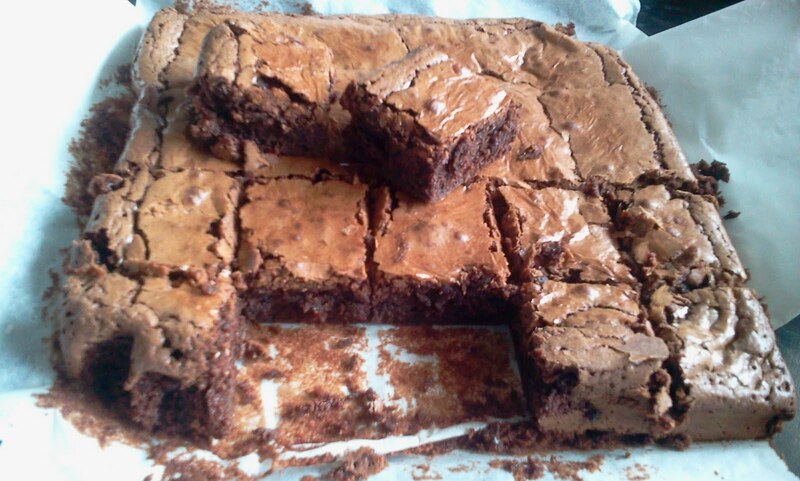 Despite my initial reservations, I'd make these brownies the main chocolate brownie recipe that I use. They taste lighter, still have that satisfying crispy topping and contain less saturated fat. And, judging by the empty cake tin, they're not half bad. If you would like to try the recipe, the link is here. Do try them out and see for yourself! Also do check out my post on Nigella's very rich and thoroughly naughty Every Day Brownies from the book Kitchen. Shared on Sweet as Sugar Cookies "Sweets for a Saturday" too!